How important is my car logbook for a loan? If you've ever bought or sold a car, or if you own one right now, then you'll have heard, and been in possession of, a V5 document or a 'car logbook' as it's more commonly known. While it's an important document that acts as proof of ownership of any car, it's vital if you're looking to take out a logbook loan. What is a car logbook? The V5C (or car logbook), is an official document that's used by the Driving and Vehicle Licensing Authority (DVLA). Each one is unique and acts as a proof of ownership document for every car and its registered keeper. The DVLA hold all the details of every registered car and it's owner across the UK. If you're in the fortunate position of buying a new car from a main dealer or a used car from an independent car seller, then one of the many things they'll take care of is the 'paperwork'. And this involves the completion of your car logbook. Your new car will be registered to them. When you enter your agreement to buy the car, you'll give them your name, address and other details and they'll complete the form and register you as the new owner automatically. Once this is complete, the dealer will send the completed paperwork to the DVLA and you should receive a brand new car logbook within 6 weeks. You'll then be on the official record as being the registered owner of that vehicle. While the new logbook is being prepared and sent to you, there will usually be a temporary proof of ownership form given to you by the dealer that you should keep hold of. If you need to prove so, it will act as confirmation that you own the car until the real logbook document arrives. When it comes to selling your car, the whole process is basically reversed. The responsibility will be on you to transfer the proof of ownership onto the new owner. This will guarantee that you're no longer the registered owner of the car. It's common practice - and a good idea - to do this straightaway, usually after the sale has been completed and while the new owner is still with you. Once filled in, you can send the completed form of to the DVLA and registration is moved to the new owner within 4 - 6 weeks. This is an important step because if you delay this, the new owner could incur various fines that you would be responsible for because the DVLA will still have you as the official owner on their records. You car logbook is one of the most important documents to keep updated, along with your driving license. If you ever move house or change your name, then you can contact the DVLA and complete any of the relevant forms. This is usually free to do, but you could be fined up to £1000 if you don't tell them. Plus, if you've moved and you're due a car tax refund, the cheque will go to your old address! So probably best to make a note to change your details as soon as you can. If you're looking to take out a loan in the normal way, like through a bank or other online lender, then you'll probably need to list your car as an outgoing. But this will only usually apply if you're still paying some kind of finance on the car. This will give the lender a clearer picture of what your monthly outgoings are which could affect how much they'll lend you. However, if you own your car outright and aren't paying finance at all, then it's not a problem. So if you're looking to use your car for any logbook loan, then proof of ownership and a logbook is vital. A logbook loan is the term used for a loan that's taken out in your name and uses your car as security against it as long as you own it. A value is put on your car at the current market rate, which you can then borrow and pay back under the terms you've agreed with your lender. Why should I take a car logbook loan? Logbook loans are an increasingly popular way of borrowing money. They're an ideal way to give yourself a fast cash injection to help you cover an emergency you need to pay or even if it's just to help towards a family holiday or celebration. They're also a great way to borrow if you have a low income or bad credit and you can still use the car day to day like you normally do. How can I take out a car logbook loan? If you own your car outright (with no outstanding finance attached to it) and have your car logbook to prove you own it, then you can take out a logbook loan. The logbook for your car is an essential piece of the process that allows you to apply for a logbook loan, so make sure you can lay your hands on it when you need it. Who can I take a logbook loan with? One of the leading logbook loan lenders in the UK is Car Cash Point. 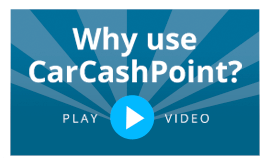 With almost a decade's worth of satisfied customers, Car Cash Point have both flexible and transparent loans, together with award-winning customer service, to help you find a logbook loan that's right for you. With no hidden fees or charges, no credit checks, loans from £500 to £100,000, a low-interest rate and an easy application process, it's hard to beat. Car Cash Point also offer a Best Rate Guarantee. That means if you find another logbook loan lender with a better rate, Car Cash Point will beat it by 10% - guaranteed. For more information, talk to our expert customer service team today on 0333 220 4419 or fill in our online application to see how we can help you.